Life is like the changing seasons. There is a season for everything. Some seasons are harder than others. Some we look forward to and some we dread. Some times in our life are like the long hard winter where everything is suffering and stagnant. But what always follows winter? Always, since the beginning of time, spring time follows winter time. It was cold and bitter, then comes sunshine and new growth. A very wise man taught me about the changing seasons and it began to change my life. 13 years ago I stumbled into the office of Mr. Jack Winton. Mr. Winton was a highly successful businessman in El Paso, Texas. At the time he was in his late 70’s and had even more wisdom than he had money. His wisdom he shared. His money he invested. I was on the receiving end of his wisdom and he became my mentor. He introduced me to the teachings of a man named Jim Rohn. Jim was a motivational speaker whom I had never met in person, but I invited him into my life to speak to me every day. Jim Rohn had a 6 CD set of teachings called “The Art of Exceptional Living”. I listened to these same teachings over and over again until I had them memorized word for word. There’s tremendous value in having someone wiser than yourself speak into your life. There’s also tremendous value in listening to the same teachings more than once. Today we are one click away from a million podcasts with a hundred different episodes each. We’re overwhelmed with information, listening to an abundance, but most remains surface level. Jim Rohn’s teachings were different for me. They were all I listened to for 2 years. The same 6 CDs on repeat. And oh how right he was. As my life went through seasons, I learned I couldn’t change the seasons. Life was going to happen and I could fight it or I could learn from it. I could be miserable or I could seek the good. I could get bitter or I could get better. I COULD CHANGE. Each change of the seasons of life offers an opportunity to live an extraordinary life by changing yourself. I’m a summertime kinda girl. I love sunshine and sandals. I look forward to it every year. I also dread it’s end every year. But as I’ve grown, I recognize it is the winter that makes me appreciate the summer. It is the cold that makes the returning warmth so treasured. Do you think that perhaps God in all of his wisdom knew exactly what we needed for growth? Do you think it’s all by design so we could learn to grow and change ourselves and live the extraordinary life he has offered us from the beginning? I believe so. What is good and beautiful and right in your world today? Understand that world is changing. Savor it now. It won’t always be this way. Life changes. Plain and simple, nothing stays the same. Sometimes that’s a good thing and sometimes it’s the most painful thing you will ever experience. For everything there is a season and a time for every matter under heaven: a time to be born, and a time to die. Seasons change and we must allow them to change. We can’t cling to a winter season forever. Spring arrives and we must step into it. Please listen to me, clinging to the winter where you lost something so precious doesn’t honor what you lost. When the winter passes and spring arrives, you honor what was lost in the winter by caring for what is now growing in the spring. Winter is now over. Spring is here. It is time for you to grow my friend. Your opportunity to get better is now. 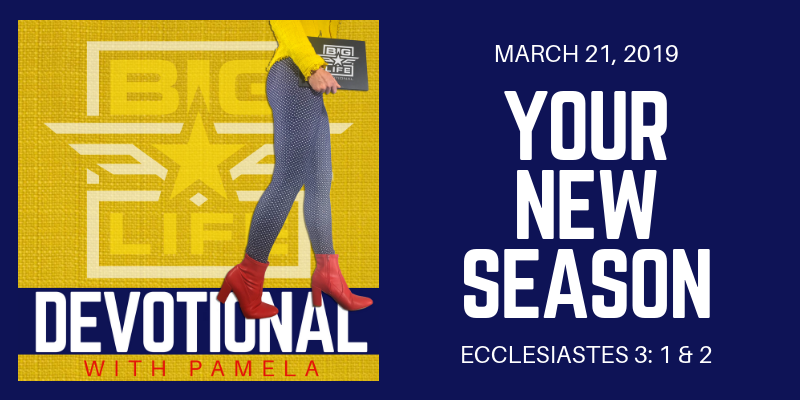 God allowed you to go through that winter in preparation for this new season. Deep down within you something has been changing and for the longest time you didn’t know what it was, but now it’s beginning to break through in your life. Just as the tulips which have been laying dormant in the frozen ground all winter have now had their breakthrough, bursting through the dirt in their sudden growth spurt, so are you. Your growth spurt is here. The time for laying low and just surviving is now over. It’s time to grow. It’s time to blossom. It’s time to do everything you can with this season you’re now stepping in to. For everything there is a season and your season just changed. Welcome to spring time. The winter may have been hard, it may have been bitter, but don’t allow yourself to be hardened and bitter. You can step into what God is doing in your life now with wide open eyes and a grateful heart because of what you have been through. It’s time. God brought you through it so you could change. You’re now changed. Live your life as a woman who has been changed. A woman who is growing. A woman who knows this season of life won’t last forever either and you’re going to embrace it and live it for all it’s worth.